Deebot D77 combines a robotic vacuum with a detachable handheld canister vacuum! This machine provides you with true 3-dimensional cleaning ability. You can easily clean any surface in your home no matter the size, shape or location. The Deebot D77 system will change everything you thought you knew about robotic vacuums. The robot is full of smart cleaning features: it can automatically clean all types of flooring, including wood, marble, and low pile carpet. It has 4 cleaning modes, an effective agitator brush, dual side brushes to clean along edges and in corners and a slim design to clean under furniture. Deebot D77 even empties its own dust bin and automatically recharges itself when the battery gets low! Deebot also has multiple hi-tech sensors to stop it from falling down the stairs, protect your furniture, and avoid obstacles in its path. Intelligent time scheduling allows you Deebot to clean any time - even when you're not home. Deebot D77 doesn't stop at cleaning floors. With the detachable handheld canister vacuum and its accessories, you can easily clean other surfaces in your home. Cleaning ceilings, walls, closets, kitchen cupboards and keyboards are all a piece of cake with D77. Relax and enjoy a cup of coffee, the versatile Deebot D77 has everything you need for 3-D cleaning. An advanced robotic vacuum system integrated with a detachable handheld canister vacuum providing you with 3 dimensional cleaning ability. Automatically cleans all types of flooring whether it is wood, marble or low pile carpet. It has 4 cleaning modes, an agitator brush, dual side brushes, slim design. Automatically empties its own dust bin, automatically recharges itself when the power gets low and has multiple sensors to avoid obstacles and stairs, and comes with a remote control. Has intelligent time scheduling so you can program your robot to clean even if you are not at home. 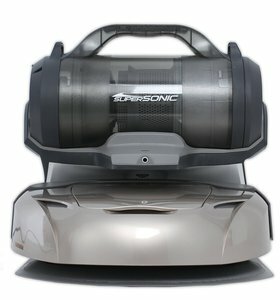 Includes a detachable handheld supersonic canister vacuum with 12 attachments.